Riverside Square (Lofts on Queen) represents the shape of things to come in this vibrant downtown east neighbourhood. A constantly changing kaleidoscope of people and places, always fresh and fun, a lively fusion of new cafes, stores, yoga studios, a new edge with a youthful vibe and downtown attitude. Inspired by the exciting renaissance that is driving this neighbourhood, Riverside Square combines the best of old and new in a well-connected and convenient location. 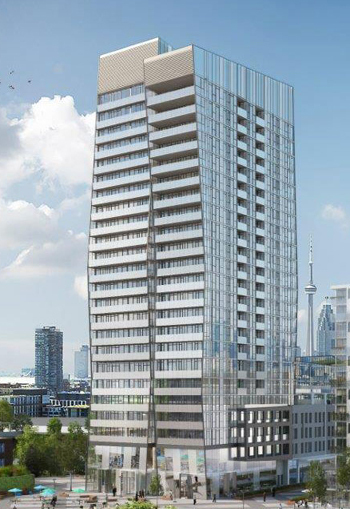 Riverside Square is located at 677 Queen St E, and will be made up of two buildings (24 and 7 storeys, 317 suites in total). Riverside Square will also include 2 and 3 storey townhomes. Suites range in size from 435 sq ft to 1830 sq ft. Prices are starting from $259,900 for the studio unit, to $989,900 for a 3 bedroom townhome. VIP sales are underway, with great builder incentives.